All 5D Blog articles from June 2017 onwards can be located on the 5D Website at www.5d-blog.com No more post will appear on blogger from this point. Well, well, well. Another week and another bold proclamation made in the general direction of 5D Headquarters. 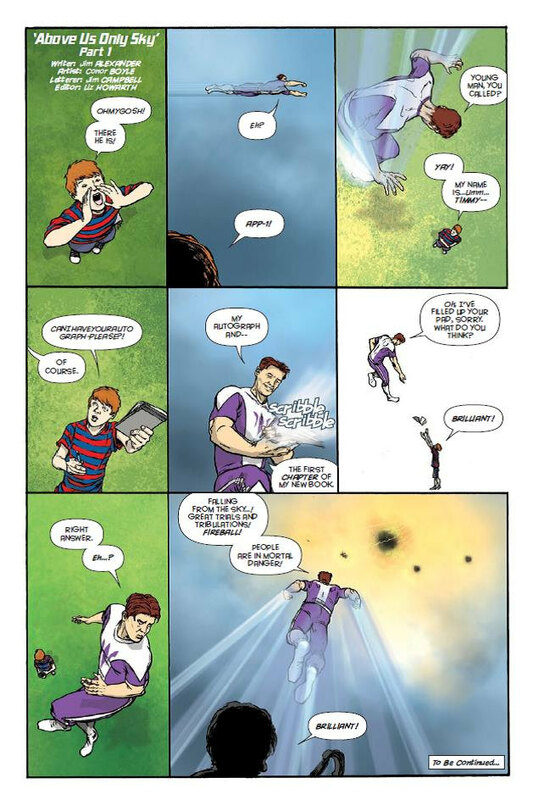 The boast came from non-other than comic book writer, Jim Alexander, who told me that; "Planet Jimbot has a new book out; a super-hero comic with a difference. I know you've probably heard this a thousand times before, but ..." Hmmmmmm, well as you know I can never ignore such brave (some would say foolish) claims without regarding them as something of a personal challenge. After all, In my never ending refusal ever to 'grow up' (whatever the hell that actually means) I have read during my life (and will continue to do so) my fare share of comics. As an obvious consequence, I have encountered more superheroes than I could shake a piece of Kryptonite at. Jim is indeed correct, In that I have heard the claim a thousand times before and occasionally, just occasionally, the claim can turn out to have some merit. So bearing this in mind I decided to do a little more research and find out for myself. I say 'find out for myself' because the vast complex of 5D headquarters is a little empty at the moment due to my loss of another cheap lacky assistant after her shoddy and unrealistic claims of overwork, no pay and few breaks (she had 15 mins a day for crying out loud). I cannot comment, for legal reasons, on her final reason for leaving being due to my request that she perform her research activities in a specially bought Princess Leia outfit. My legal team is currently working on a response to that totally unfounded claim, just as soon as they finish dealing with the other restraining orders. 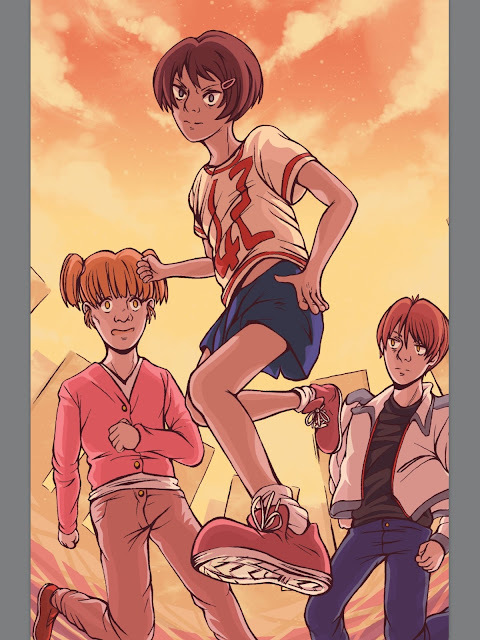 "In a world overrun by terror, despair and monsters, three kids cling on to the belief that there once existed a champion of good, a super-hero now gone and all but forgotten. Despite the dangers and sheer hopelessness of the situation, they decide to go in search of the super-hero once known as App-1." When reading App-1 #1 one can immediately see why this comic is indeed a little different to many others. The book is written by Jim Alexander (Samurai Jack, Penguins of Madagascar) with stunning art by Eva Holder (Bad Tooth), Conor Boyle (Dead Roots) & iella (The Ugly Duckling). Perhaps the most noticeable element of this is the way that the reader is transported along three distinctly different time periods through the course of the first edition; the Present, the Recent and the Past. As one works ones way through the comic the reader begins to discover how all three stories are connected as we ask the question, how can a world protected by a super-hero at the height of his powers end up being taken over by monsters known as Bogeys?! 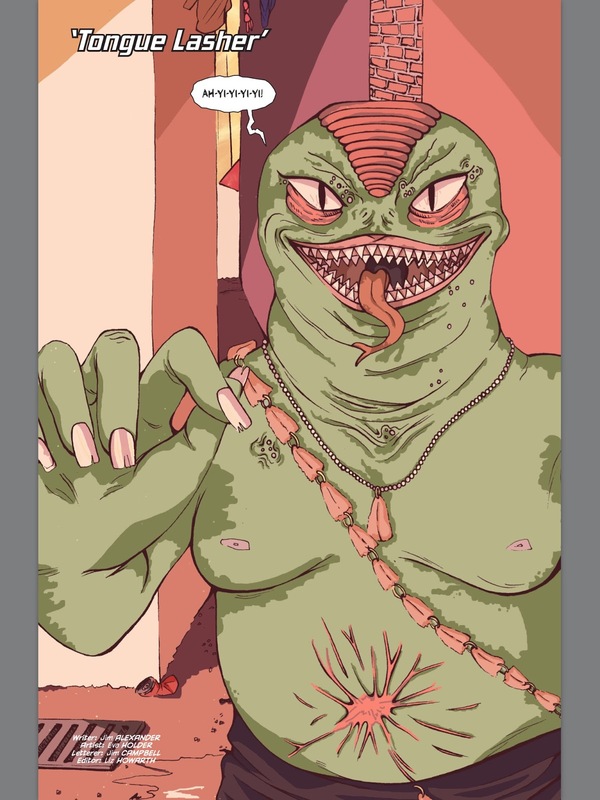 The present takes place in the first story, Tongue Lasher, which is written by Jim Alexander and contains artwork by Eva Holder. The Present is a time when the world has been overrun by monstrous Bogeys, one of whom we are introduced to immediately, the aforementioned 'Tongue Lasher' who is about dish out some of his/her/it's own brand of 'Bogey justice' to one of the poor locals. I have to say that this is a lovely innocent, almost whimsical opening section in which the artwork and dialogue perfectly captures the bleakness and hopelessness of the situation that the world depicted finds itself in. However at the same time there is something of a quaint and traditional feel to it all which perfectly encapsulates the 'Doctor Who' sensibilities that Jim Alexander told me that he was attempting to convey in the story. He does this very well. The Past comes next (of course it does) in the issue with the story, ‘Above Us Only Sky’ which is written by Jim Alexander, with the artwork this time by Conor Boyle. In the past we see a glimpse of the hero in action together with an interview with App-1 from back in the olden days when he was at the height of his super powers. There is no hint here of the tortured soul we encounter later in the time line, here we are introduced to a supremely confident and charismatic superhero who is reminiscent of every clean-cut comic book champion of the young and innocent. Sandwiched between the two parts of the episode from the past is a magazine interview with the celebrity that App-1 has now become, which is a very nice touch in which we learn a little more about the personal ethos of the superhero - in between him trying to plug his latest book, that is. In fact we see that while he may well be a well-meaning protector of the world, he is in fact, well very nice, but ever so slightly dim with his touchingly insipid celebrity-speak remarks. I love the part when he attempts to describe the ethos of his book; "It’s my personal vision of how I see the world and all her peoples growing and coming together. 'People synergy’ is what it is." The artwork for the past by Conor Boyle is vibrant and rich, perfectly mirroring society's optimism and self-confidence in this time period. The final segment in issue #1 is The Recent past, which is again written by Jim Alexander and with the artwork on this occasion coming from iella. This Monsters origin story in dealing with how the Bogeys come to be is perhaps my favourite of the three time line sections. We see now how the once mighty hero has by now encountered some hidden inner torment. He is not only questioning the level of goodness within him, but also is terrified by the darkness that seems to be slowly engulfing his soul. Enter a Einstein/Freud scientific figure intent on helping the not-so-now-super hero. As the section progresses it cleverly reveals the shocking truth as to how the Bogeys came to prominence. I know everybody always says this, but I certainly didn't see the fabulous twist coming at the very end - brilliant! To put it in straightforward terms, this is a sensational first issue! Apart from the sparkling dialogue from Alexander and the quite beautiful pictorial work by the various artists, the strength of this story is the clever use of the separate time lines. In using this method of the different time periods it means that the reader is neatly steered away from the normal linear method of story telling and so results in a decidedly different kind of satisfying experience. The use of a different artist for each section is another clever touch which serves to give each time period a distinctive character and feel of its own; the past, in which App-1 is at the height of his powers, is appropriately richly coloured and textured to heighten the optimistic feel of the time line. In contrast, the present takes on an entirely different look in which the look, whilst still vibrant, nicely captures the loss of the hope that once abounded. Yes, yes, Yes. I admit it. 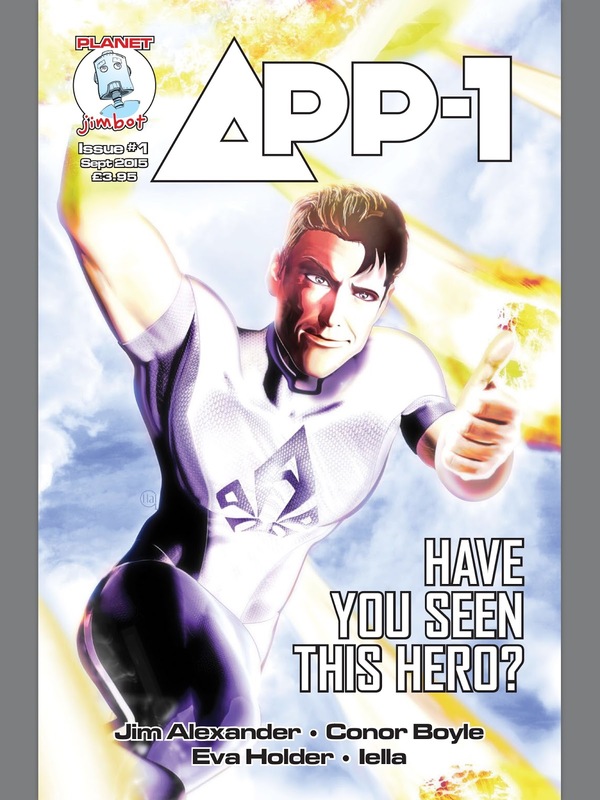 Jim Alexander was indeed spot on with his boast that App-1 is a comic book with a difference. 5D BLOG ARTICLES HAVE MOVED! There is a brand new 5D. The Fifth Dimension website. On the website you will also be able access the posts from this blog, plus a wealth of other material (including information on submitting work for review and promotion). King Falls AM - Episode 6: King of King Falls.